I need some help figuring out if I can get a full size (8”) jointer into my basement workshop, and if so, the best way to get it down there. The chief problem is a 90 degree left turn into my shop at the bottom of the stairs. 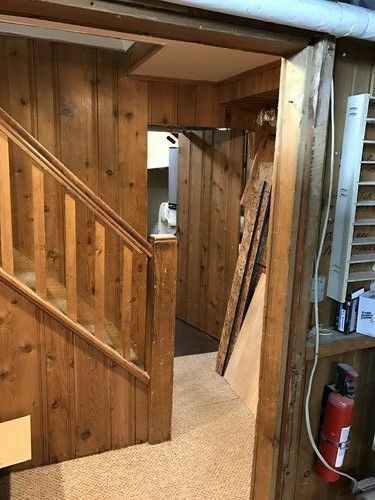 Here’s another opposite the door at the bottom of the stairs (the wood piled at the bottom of the stairs is movable). The measurement from the floor to the bottom of the door frame is 70”. If I had to, I could cut out the railing and banister if it would help make the jointer fit. This is the jointer I’m interested in getting. It is 76 3/8 long and 564 pounds. This is an alternative (72”) if I had to. My plan is to hire a professional mover to get it in the house. Can you all help me figure out if they will be able to get it to fit before I order the machine and it is delivered and doesn’t fit? If other measurements or pictures are needed, I can get them. Is there a kind of mover I should look for and ideas of what it should cost? Any other advice or guidance is appreciated. I’d guess that’s going to arrive in several pieces. I’d bring it down bit by bit. Call grizz and find out what your dealing with so you can plan the move or go with the other machine. Give information to professional movers. Let them decide if & how to move it. Me thinks you’re just gonna have to take it apart and put it back together in the basement. I’d rather do that myself than have professional movers do it. They probably won’t know how to align it and set it up properly unless you just want them to carry the parts for you but friends and neighbors could do that. Maybe your local Grizz dealer has some guys who want to make a little extra cash on the side and disassemble and reassemble and tune it for you. I just moved PM 60HH into my basement shop last month. Not quite that heavy but the jointer bed without the base was right around 300 lbs. Two of us moved it down using a hand truck, including around a 90 deg. landing on the steps. Yours should be an easy task for 2-3 experienced movers. The first thing you will have to do is get that fire extinguisher off the floor. According to the manual, it should ship in two boxes – the machine will be in a wood crate (81×25 x 13 in.) and weigh ~400 pounds, the other is a cardboard box (38×18 x 28 in.) and weigh ~150 pounds. A couple of good size helpers and a hand card should not have too much of a problem. Alternatively, since you will have to assemble it anyway, you could just un-crate everything and take it down piece by piece. Doesn’t sound like anything that would require hiring movers to do IMO. To add to Brad’s comment, when I got my Delta 8 inch it arrived in two boxes; the table was in a fairly sturdy wooden crate. It was carried into my basement shop by two relatively large delivery guys with my help. If your table is crated similarly it could be tipped on end to get around the corner. Your jointer is the Drizzly equivalent of my old Delta and it is probably crated as nicely as Brad described above. Having pros help you move it is a real plus. When I upgraded to a larger jointer, a friend of mine suggested I contact his friend, a professional rigger, and the second guy brought his crane to help me remove the smaller Delta and drop in the larger jointer. It was worth the money to have things moved safely with minimal “damage” to the house. Marc damage was scraped door frames, dented metal door, otherwise nothing bad. 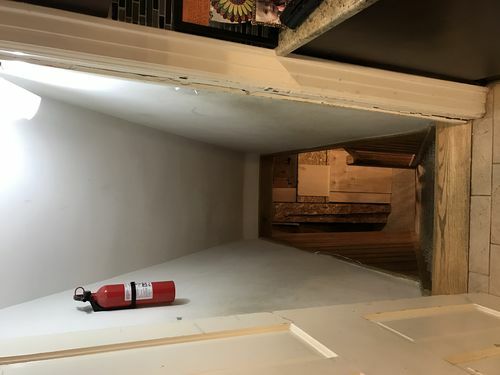 To clarify the comment about the fire extinguisher being on the floor—for some reason the pictures were turned sideways when I posted, I don’t know why, they look right on my computer (tilt your head left to see them the right way). Thanks for all the suggestions. I’m definitely not going to attempt this on my own, there’s just too much risk for injury and damage. I’ll get movers to do it. 1. Given that the bed length is 76 3/8 long and my doorway is 70” high is there any way for y’all to help me figure out if the movers will in fact be able to get it in the door. 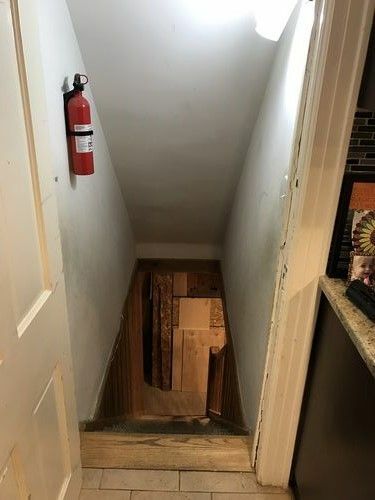 I realize they will be able to tilt it, but my concern is navigating that 90 degree turn at the bottom of the stairs with a 76” long bed especially with the banister there. Am I overthinking this? @Mrunix above points out that it comes in two shipments: a wood crate (81×25×13 in.) and weigh ~400 pounds, the other is a cardboard box (38×18×28 in.) and weigh ~150 pounds. 2. Any ideas what I should expect to pay the movers for the job so I don’t get ripped off? 3. To get the machine on the stand am I going to have to install a winch on the ceiling? Maybe I can get the movers to lift it on too? Taking bannisters off usually helps a lot. I helped get a 1500 wood stove down a basement stairwell once as well as a pool table. 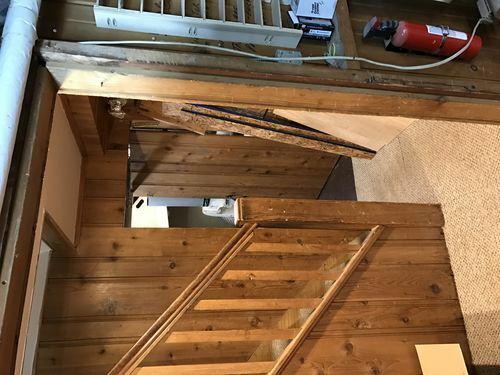 With the pool table we had to remove the bottom 4 stairs because the angle of the ceiling was steeper than the angle of the stairs, to this day I hit my head on the ceiling about 3/4 of the way down that stairwell. I would rent borrow or buy an engine hoist. You can get a pretty cheap one from harbor freight that will do the job. Got a straight shot with a window? 1. Given that the bed length is 76 3/8 long and my doorway is 70” high is there any way for y all to help me figure out if the movers will in fact be able to get it in the door. Just Johnny Cash that mother and be done with it! Would that be paint it black or give it drugs?